More than 20,000 employees from various sectors were made redundant as of September last year, the Malaysian Employers’ Federation (MEF) said, pointing to a challenging year ahead for big companies in the country. With no indication of improvement to the gloomy economic outlook, MEF executive director Datuk Shamsuddin Bardan said the trend was set to spill over to 2016, which could see more retrenchments and companies ceasing operations. In 2014, it was reported that there were more than 10,000 retrenchments. At the same time, Shamsuddin said, hiring slowed significantly this year with only necessary positions filled. Shamsuddin told The Malaysian Insider that the figure, obtained from the Human Resources Ministry, covered employees from various key sectors, including oil and gas, banking, retail and manufacturing. MEF, however, said it did not have details on the number of companies involved in retrenchment exercises in 2015. “In the Malaysian context, even though the economy is expected to grow by 4.7%, the outlook for most sectors is not very encouraging, and it has been very challenging. “To be fair also, 6,000 (employees retrenched) was the result of Malaysia Airlines’ (MAS) restructuring and that contributed quite a huge percentage to the total retrenchment (in 2015). “By end of 2015, we expected it to touch 25,000 of total retrenchments. This is expected to continue in 2016 because it is not seen as a positive year,” he said. MAS’s retrenchment of nearly 6,000 employees was part of Khazanah Nasional Berhad’s plan to restructure the loss-making national carrier. The Edge Weekly also reported that Shell Malaysia would cut 1,300 upstream jobs over the next two years, adding that job cuts in the oil and gas industry were expected because of the collapse of oil prices. 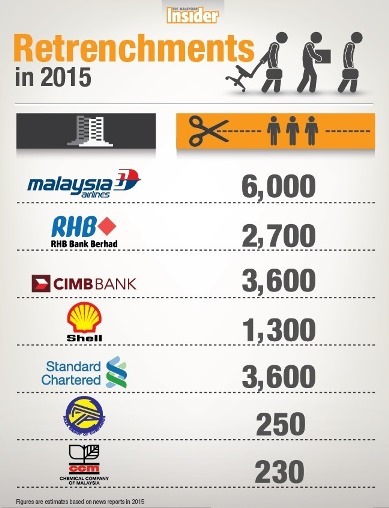 Retrenchments in 2015 also saw the banking sector cutting down its workforce, starting with Standard Chartered Bank laying off its Malaysian workforce by 11%, followed by CIMB Group Holdings Bhd (3,599 employees or 11% of its headcount) and RHB Capital Bhd (2,700 employees or 15% of its workforce). It was also reported that manufacturers, such as Naza Automotive Manufacturing Sdn Bhd laid off 255 workers from its plant in Gurun, Kedah, and CCM Fertilisers Sdn Bhd, a subsidiary of Chemical Company of Malaysia Bhd, announced the dismissal of 232 employees as part of plans to shut down of one of its plants by June this year. Besides private sector retrenchments, Shamsuddin said the government sector froze hiring. Asked if retrenchment was a preferred solution for companies to reduce their overheads, Shamsuddin said the move should always be the last option. He said there were other practices, such as reducing pay or asking employees to go on unpaid leave. “For companies, they know times are hard but in the event the economy recovers, they may be able to quickly summon back these employees and resume their business. Shamsuddin cited Cycle and Carriage Bintang Berhad’s move in the previous financial crisis, where the company gave options to staff to go on leave and allowed them to do other jobs during the period to retain its skilled workforce. “They didn’t want to lose their skilled employees, especially in the maintenance section, to their competitors but they could not sustain full employment, so they gave the option to employees to take leave and didn’t have to come to work but were paid a certain amount of wages. Shamsuddin said positive policies from the government were also needed to encourage companies to stay on and retain their employees. He added that some countries provided incentives to employers who did not retrench their workers during difficult periods. Malaysian Trades Union Congress (MTUC) secretary-general N. Gopal Kishnam, meanwhile, said the trend of companies opting to reduce workforce was alarming. “Most of the MTUC affiliates are saying that companies are conducting VSS (voluntary separation scheme). VSS here is equivalent to retrenchment. “Although it is voluntary, in most occasions the middle management staff will convince those permanent workers that they need to be removed, they (management) will use all sorts of tactics to convince them (to accept VSS). He said it was hard to determine if the dismissal of employees was done in accordance with the law as employers used different approaches, such as VSS or MSS (mutual separation scheme). “When it is VSS or MSS, it does not apply to provisions of the Employment Act. Gopal Kishnam said the government must come out with concrete policies to overcome the situation as today’s political scenario did not help much in convincing investors. He also conveyed workers’ fear that employers might be using today’s economic slowdown as an opportunity to replace local permanent workers with cheaper foreign labour to save costs.